Methods for accurately staging the axilla continue to evolve but remain dominated by sentinel lymph node biopsy (SLNB) which is now widely practiced and accepted as standard of care worldwide. Dual localization methods with blue dye and radioisotope are associated with optimal performance parameters such as shorter learning curve, higher identification rates and low false-negative rates. Several issues relating to surgical technique and choice of tracer agent remain unresolved, and the role of intra-operative nodal assessment remains unclear. Indications for SLN biopsy have broadened and now include some tumours larger than 5-cm, multifocal tumours and higher grades of ductal carcinoma undergoing mastectomy. 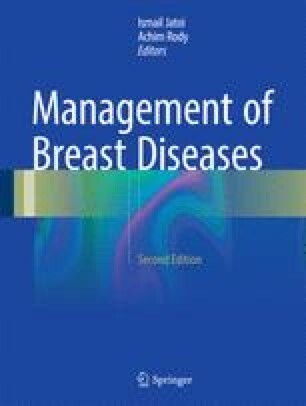 The complexity of axillary management has been compounded with realization that completion axillary lymph node dissection may not be essential for all SLNB-positive cases containing macro- or micrometastases; adjuvant therapies may adequately deal with modest degrees of tumour burden in non-sentinel lymph nodes without compromise of regional control nor overall survival. Patient selection and timing of SLNB in the context of primary chemotherapy is shifting towards SLNB post-chemotherapy. Downstaging of biopsy-proven nodal disease may allow SLNB to be safely performed after chemotherapy with acceptable false-negative rates. Outstanding questions relate to management of SLNB-positive patients post-chemotherapy and whether recommendations for radiotherapy should be based on nodal stage at presentation or following induction chemotherapy. Britton PD, Goud A, Godward S, et al. Use of ultrasound-guided axillary node core biopsy in staging of early breast cancer. Eur Radiol 2008. doi: 10.1007/s00330-008-1177-5. Douek M, Monneypenny I, Kothari, et al. on behalf of the SentiMAG Trialists Group. Sentinel node biopsy using a magnetic tracer versus standard technique: the SentiMAG multicentre trial. Ann Surg Oncol 2013: published online Dec10. doi: 10.1245/s10434-013-3379-6. NSABP Clinical Trials Overview [Internet]. Pittsburgh: National Surgical Adjuvant Breast and Bowel Project at the University of Pittsburgh [cited 2015 November 13]. Available from: www.nsabp.pitt.edu/B-51.asp.